I want to hang out with you in Los Angeles! Whenever I read about the sewing blogger meet ups that are organized in London or New York I get super jealous. I want to hang out with other ladies that sew too! Well, I'm going to get my chance on Saturday, June 14th. Kathy, Jill, Laurie, and I have been scheming for the last month and have decided to organize a get-together for the ladies in southern California. We are going to meet up at 11:30 at the restaurant next to The Fabric Store, Cafe Midi, and have lunch, do a pattern/fabric swap (if you want to), and talk sewing. Afterwards we are going to The Fabric Store and then Mood for some shopping. If you are in the area I hope you will join us! Just a couple of FYI things: you don't have to join us for lunch, although we hope you do! You can always join in for the shopping part of it, however I don't have an exact time on when we will be done eating. If you DO decide to join for lunch please comment on this post or e-mail me to let us know. I'm going to make reservations for Cafe Midi a week beforehand, so if you could please e-mail me before June 7th I would really appreciate it. I'm so there! I have been sewing, crafting knitting forever, just recently started my own blog. Noidlehandshere.com/wp/. Of course I know some seamstresses/sewers in LA, but am always happy to meet more. Hi Leah! So awesome that you are coming to the meet up :) Your friends are always welcome to join too! P.S. Your blog is amazing! I love your knitting projects! I'll see if I can find others to come along. Super excited for this! Count me in for lunch and shopping. This will be my first trip to The Fabric Store, can't wait! Looking forward to meeting you Erin... and shopping... and eating... and having just an all around great day! Awwww....I don't think I can make it down. Post lots of pics! A few delegates from our LA sewing group (Stitch in the Ditch) will be joining. Not sure on the numbers yet, but probably 4? Awesome! Maybe I'll head down to socal and meet up! I have no talent for sewing, but taught myself the basics when I inherited a bunch of patterns/ fabric from the 40s, 50s, 60s and 70s from my mother-in-law. Yay, it's about time for an LA meetup! I always had the feeling there are more sewists in Southern California than it seems like, but I've only met a handful. 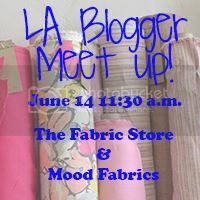 I live in Santa Barbara, and by next month I'll be way overdue for a LA fabric trip, not to mention getting to know some fellow bloggers! Count me in! I'd love to meet you all! I'll be there! I'm excited to meet more sewists! so fun! i want to hang out with YOU in LA too!! I would love to join you. Please count me in for lunch, shopping and swap. I went to the Fabric Store today and bought a couple of pieces of really special fabric. Aww man I need to move outta the country side or something...always so far away! Your new site is looking great! I would love to join you guys! Talking sewing with a bunch of people sounds like an awesome day. I will be there for lunch, too - I have a lot of patterns I've decided I am just never going to sew! My blog is: dotsstripesandflorals.wordpress.com Yay! Is driving in from Arizona a little crazy? Cus I really want to join. Okay I'm really easily convinced lol I will have to come in and make a weekend of ti! I'm so excited about this! I already asked for that weekend off! Maybe when it gets closer you could post a list of the bloggers who'll be attending so we can make sure to check out each other's blogs before we meet? Oh, and count me in for the lunch and everything! Please do Tanya! It would be awesome to meet you in person finally! I don't have a blog, but read all y'all's stuff and am always jealous of the east coast's meetups. I'll be coming up from San Diego and spending either Friday or Saturday night. I'd be up for getting a suite to help with swapping space, though it may be a few miles from there. Anyway, I'm in for lunch and shopping! How exciting! 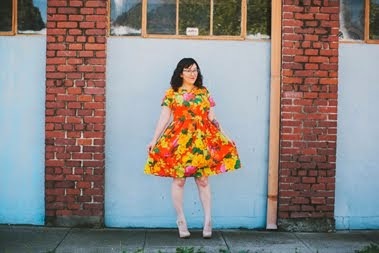 I don't really blog my sewing projects, but I love reading all these blogs. I'm in for shopping and lunch! And I'm going to bring sewing extraordinaire friend Sarah too! Eleyna you are joining is right?